Revenue from the federal nutrition program is an appreciable portion of grocery sales around the United States. In rural areas, where a greater percentage of households received SNAP benefits, it’s an even more important economic engine, say grocers. As a new report shows that rural households are about 25% more likely than urban ones to participate in the Supplemental Nutrition Assistance Program (SNAP), rural grocers say the federal nutrition program is an important part of the revenue that keeps their stores in business. Yoss said his stores earn about 11% of sales from SNAP, which provides a cash-like benefit to low-income Americans that can be spent only on food items. Other stores Yoss works with in harder-hit rural areas earn as much as 20-30% of their revenue from SNAP, he said. SNAP accounts for 9% of grocery sales nationally, according to the Food Marketing Institute. SNAP eligibility is based on income and household size. Rural families earn less than urban ones on average, and the difference in SNAP usage rates is, in part, a function of that difference. Nearly 90% of counties with a usage rate of 30% or greater are nonmetropolitan, the report said. 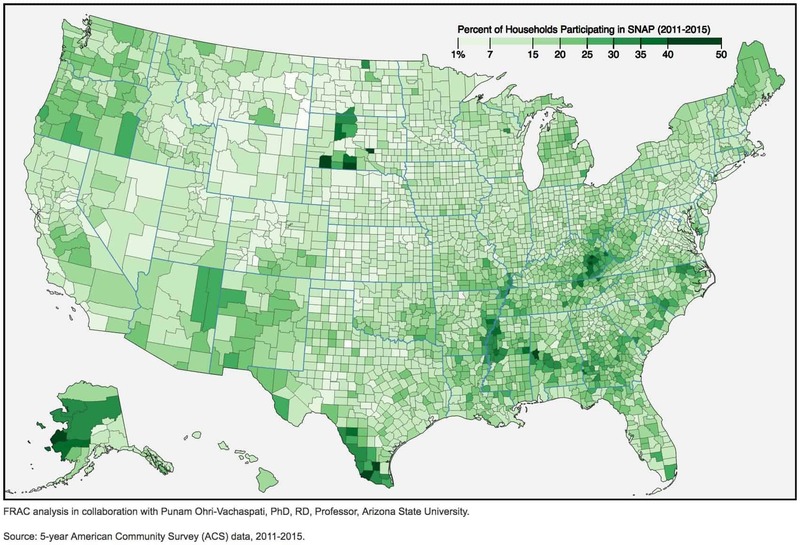 The states with the highest rural SNAP-participation rates are clustered in the South. When household income drops, the federal nutrition program can help make up the difference in the local economy. That can be critical for small stores in rural areas with a limited customer base. The economic impact doesn’t end with the grocery business, he said. Researchers have put numbers on that economic benefit. A dollar in food stamps generates $1.79 in additional economic activity, according to a study by the USDA Economic Research Service. In other words, buying $50’s worth of groceries with food stamps creates nearly $90 in economic activity in the community. The 2010 report estimates that every $1 billion in SNAP spending was responsible for creating 10,000 full-time-equivalent jobs, including about 1,000 jobs in the ag industry. It’s not just small stores where SNAP is an important part of the revenue stream. A Fortune.com report from June says that cuts proposed by the Trump White House would affect nearly $71 billion in sales over a 10-year period. The biggest loser would be Walmart, where 18% of all SNAP benefits were redeemed in 2013, the report said. Next in line for the biggest sales impact from food-stamp cuts would be Target and Aldi. If there’s any doubt that SNAP means business for grocery retailers, Amazon put that to rest earlier this year when it tested participating in the SNAP program for online food sales. About 43 million Americans rely on SNAP for some of their monthly food spending, according to SNAP to Health, a group of health professionals and scientists that works with USDA to study the program. 44% of all SNAP participants are children (age 18 or younger). Almost two-thirds of SNAP children live in single-parent households. 76% of SNAP benefits go to households with children. 9% go to households with disabled persons. 10% go to households with senior citizens. SNAP is counter-cyclical, meaning when other parts of the economy struggle, its spending increases as incomes drop and more people qualify for assistance. Increased SNAP benefits were part of the economic recovery package enacted in 2009 to address the Great Recession. SNAP spending grew during the recession and has declined as the economy has recovered, according to a report from the Center for Budget and Policy Priorities.